Andrzej Duda dismissed Russia's idea of a "security" mission. 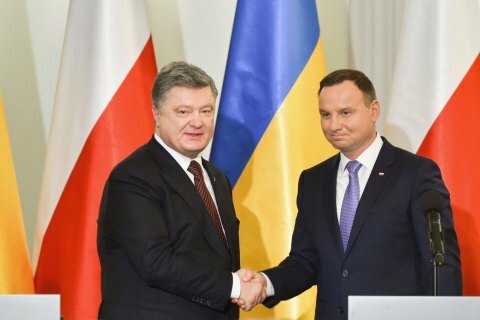 President Andrzej Duda said that Poland, which on January 1 will replace Ukraine in the UN Security Council, will support the initiative on the deployment of peacekeepers to Donbas. After the talks with President Petro Poroshenko in Kharkiv on 13 December, Duda told a briefing that Poland as a member of the UN Security Council will support the deployment the UN peacekeeping mission in the occupied territories of Donetsk and Luhansk regions. "We strongly believe that it should be peacekeeping mission in full compliance with the standards for such operations. It's role should not be limited to the protection of the OSCE monitors, it needs to be a real peacekeeping mission operating all over this territory," Polish president said. Duda believes that the Ukrainian mission can contribute to the implementation of the Minsk agreements. "We with Mr President agreed that if such a proposal of the Ukrainian side is actually put on the agenda of the UN Security Council, Poland will be one of the states that will support this initiative. We are supporters of such solution and Ukraine can count on our support here," he said. Ukraine first raised the issue of peacekeeping mission in Donbas in 2014. In June 2015, Ukraine passed a law regulating the issues of holding an international peacekeeping and security operation in Ukraine, including the deployment of foreign trrops.